The girl's birthday was earlier in the month, and in a fit of madness, we took her and six friends up to my father's house in the Catskills for an overnight. A slumber party, if you will, but two hours away. The kids had a delightful time - and actually? We did too. We fed three meals to the seven girls, they got back rubs from my father's masseuse (and I got a full-on hot-stone massage), we drove them up the valley (illegally!) in the back of the pick-up truck, they fed carrots to an elderly horse, they collected rocks in the stream, they went in the hot tub, I made them wander around a cemetery, and they had cake for breakfast. Yeah, a cemetery. 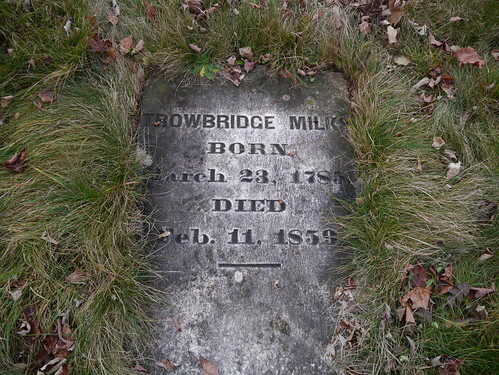 It's a small cemetery up the road a piece, old but still conducting burials - someone was planted there this summer, and Trowbridge Milk was born during the American Revolution. 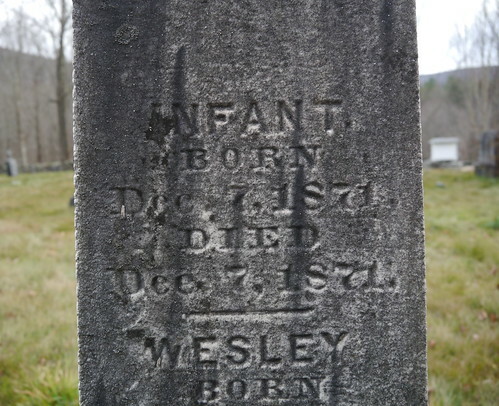 and found another unnamed infant, also born and died on the same day - this time in 1871. 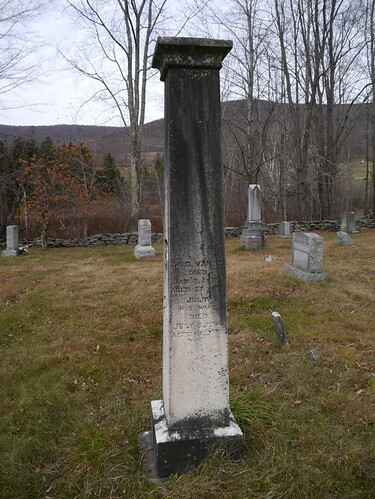 Said infant's grave marker included his/her two brothers. 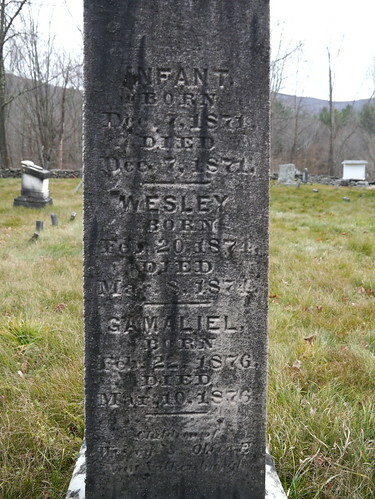 The siblings lived long enough to be named, Wesley and Gamaliel, but only lived about three weeks each, in 1874 and 1876. More didacticism. More reflection. 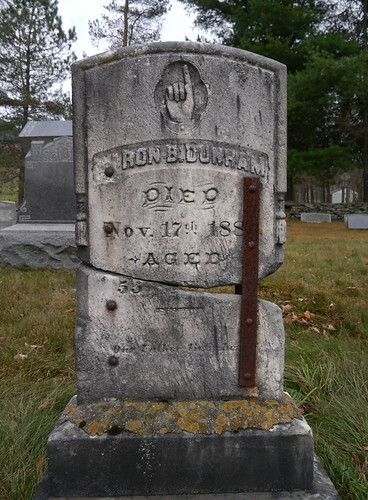 And I looked at the beautiful homely, practical repair on Ron B. Dunham's stone, metal braces unabashedly holding the top of the stone in place - though concealing his death date - sometime in the 1880s, eh? I think it's unlikely that any of the girls will remember anything about the weekend beyond the cake and the hot tub, but the cemetery is going to be an indelible part of my memory of my girl's tenth birthday. This is wonderful, Maggie. Those kids are lucky to have you. A big old lovely cemetery near our neighborhood was a favorite place for us growing up. When I got to babysitting age I took my kids there too. One year my two sisters and I rounded up all the kids we babysat for (about 25 kids in all) and gave their parents a 'treat' by taking them all on a picnic in the cemetery for the afternoon. It was raining and they all got soaked and muddy, but enjoyed the day immensely, and when I dropped off the kids of one family their mother invited me in for a cup of tea and some "non-sweet food" as an antidote. [how did she know that the lunch we packed was largely sweet stuff?! ;-) ], I wonder. So, a Vacation Slumber Party? You just turned on the travel switch for those girls. One of my best memories from THAT summer at camp was visiting an old graveyard. I love old graveyards (but not modern cemeteries). It sounds like a fantastic time. Being from the West Coast, the East Coast cemeteries really fascinate me. 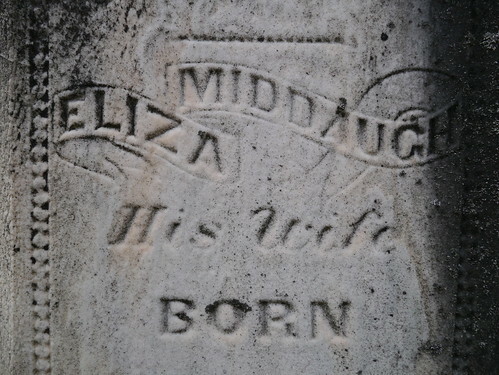 There are some VERY old cemeteries in our town. On 120 and on 117. Bring crayons and do a rubbing or two.